Ducky celebrates this year’s Chinese zodiac animal with a special design. Only 2018 pieces in existence, thus this mechanical keyboard is extremely rare. Each limited mechanical keyboard’s inscription plate is number registered to ensure each keyboard’s uniqueness and adding more collecting value. The theme of this keyboard is headlined by the Xiàotiānquǎn(嘯天犬) from ancient oriental mythology, with images of brave troops, lotus flowers and ghost heads done in ukiyo-e style to compliment the mythical dog. Zinc alloy is used to make the top cover, giving the product a solid and dynamic exterior. With a design so beautiful, the quality must also be great for the product to be special. 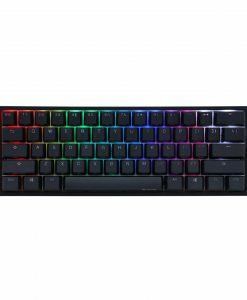 Ducky Year of the Dog Mechanical Keyboard offers a total of 6 different German Cherry MX RGB switchesthat have the life capacity of 50 million for each switch, a cross-shaped designed makes replacing keycaps easy.